Democratic Socialist Organizing Committee (DSOC) was founded in 1973 by Michael Harrington, when he led a left wing faction opposed to the Vietnam War out of the old Socialist Party USA. 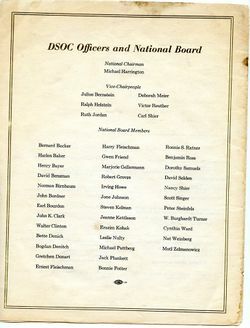 DSOC's membership included many former Students for a Democratic Society activists and "undisciplined communists". DSOC grew quickly in the late 1970s, making big inroadsinto the Democratic Party. By 1979 DSOC claimed a national membership of 3,000, loosely organized into 40 local chapters. 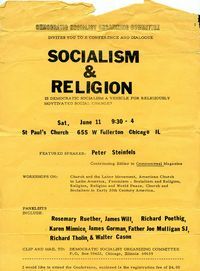 In 1982 DSOC merged with the smaller New American Movement to form the Democratic Socialists of America (DSA) - now the largest socialist organization in the U.S.
David Lewis, leader, New Democratic Party of Canada, "US economic imperialism". Panel on "socialism and the welfare state" with Irving Howe, Erazim Kohak, Norman Birnbaum. DSOC's original publication was called Newsletter of the Democratic Left. It was published 10 times a year from 125 West 77th St., New York. Those listed as helping produce the October 1973 issue were David Bensman, Henry Bayer, Gretchen Donart, David Gaberman, Tom Kramer, David Kusnet, Jon Ratner, Ronnie Steinberg Ratner, Mark Schaeffer, Nancy Shier. The editor was Michael Harrington, with Jack Clark as Managing Editor. Between 1977 and 1979 DSOC played an important and highly visible role in the Democratic Party Mid-term convention in Memphis, organized a youth group, daveloped its local chapter network, took an active role in a number of local election campaigns, developed a strong Hispanic Commission that includes a largely Cuban chàpter in Miami, Chicano members in Texas and Puerto Ricans in New York and organized the Democratic Agenda coalition within the Democratic Party. 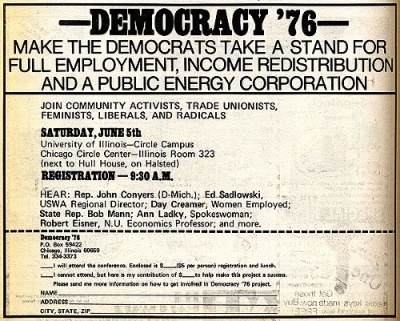 The Democratic Agenda alliance emerged from the Democratic Socialist Organizing Committee "Democracy '76" project. At that time a Washington, DC, conference attended by some 500 people set up a network to influence the regional and national meetings of the Democratic Party Platform Committee. 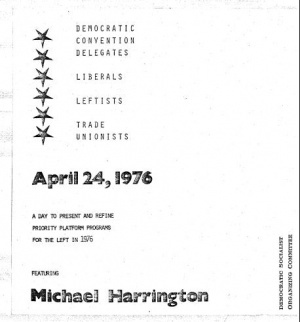 Pleased with the result of its input into the drafting of the 1976 Democratic Party platform which DSOC termed "a rather progressive document," the DSOC organized the Democratic Agenda alliance in November 1977. DSOC and the DA both operated from national headquarters at 853 Broadway 1 Room 617, New York, NY 10003 (2l2/260-32701. DSOC's Washington organizers emphasized that the DA is not a coalition of groups agreeing on a goal but, which have disparate analyses. They describe the DA as an alliance of "like-minded groups which share a broad social analysis, and which work together on a broader, more long-lived front and struggle. According to attorney and treasurer of the Washington, DC, DSOC local Alex Spinrad "if there were a mass socialist organization, Democratic Agenda might be unnecessary: unionists like Doug Fraser and William Winpisinger, Congresspeople, and community activists could all operate within the common organizational framework of a democratic socialist movement . Unfortunately, such a mass socialist base does not exist yet, but the Democratic Agenda provides an exciting vision of the potential movement. " Spinrad has argued that "Only by creating a coherent organizational framework - and a single broad analysis of social problems -can the left really achieve the long-lasting victories which can lead to truly exciting social change. That is why we are all socialists:because whether we are in the labor movement, the religious community,academia, we all recognize the need for an ideological framework on which to hang all, common, struggles." 10: 30 Workshops Full employment, economic . .restructuring. social democratization Public energy & utilities, Neo-conservatism and the starvtion of the public sector Public access to media Peacetime industrial conversion..
(Partial List):. Jack Blackburn; Director, Institute of Industrial Relations, UCLA; Calif. Public Policy Center; Ca1ifornia Tax Reform Association; Center for New Corporate Priorities; Rev. Peter Christiansen; Ben Freedman, West Coast Advisory Bd., Actors Equity; Jim Gallagher, Coordinator, Labor Studies, UCLA; Dan Hirsch, Coordinator Campus Committee to Bridge the Gap; Nick Seidita and Jo Seidita; Shirley Wechsler, Nat'l V.P. and So. Calif. Exec. Director, ADA; Hy Weintraub, Pres., Community College Council, Calif. Federation of Teachers, AFT; Burt Wilson, Coordinator, CAUSE. (Partial List): Jim Berland, Public Affairs Director, KPFK; Tim Brick, Coordinator, CAUSE; Paul Bullock, Director of Research, Institute of industrial Relations, UCLA; Rev. Peter Christiansen; Art Forcier ,Political Director, So. Calif. ADA; Jim Gallagher, Coordinator, Labor Studies, UCLA; Otis Graham, Prof. of History, UCSB; Jonathan Lewis, Director, California Tax Reform Association; Nancy Lieber, Prof: of Political Science ~ UCD; Jim Lowery, Director, Citizens' Committee Against Redlining; Jim Pino, Friends Committee on Legislation; Derek Shearer, economist/writer, West Coast Editor, Working Papers; Tom Thompson, author/publisher. A local seminar was also convened in Chicago, featuring John Conyers, Bob Mann, Ann Ladky, Day Creamer, and Robert Eisner. According to DSOC founder and chairman Michael Harrington, the influence of the group is disproportionate to its size because of the positions held by some DSOC members within the Democratic Party. In 1980 prominent DSOC members included Rep, Ronald Dellums (D-CA); Hilda Mason, D.C. City Council, Harlan Baker, Maine state legislature; Jerry Nadler, New York state legislature, Perry Bullard, Michigan state legislature; Ruth Messinger, New York City Council; Harry Britt, San Francisco Board of Supervisors; Patrick Gorman, chairman of the board, Amalgamated Meatcutters; William Winpisinger, president, International Association of Machinists ; Irving Bluestone, vice president, United Auto Workers; Martin Gerber, vice-president, UAW, Sol Stetin, senior vice-president, Amalgamated Clothing and Textile Workers , Joyce Miller, national president, Coalition of Labor Union Women ; Dolores Huerta, vice-president, United Farmworkers, Cleveland Robinson, president, District 65, UAW; Victor Gotbaum, head of District Council 37, American Federation of State, County and Municipal Employees , New York, Mildred Jeffrey; Victor Reuther; James Farmer; Nat Hentoff; Gloria Steinem; Rosemary Reuther; Harvey Cox and Irving Howe. The New York Democratic Socialist Organizing Committee, held its first annual convention, October 1979 in New York at the District 199, Martin Luther King, Jr. Labor Center. A panel on politics and social change was led by Norman Adler, director of political action, D.C. local AFSCME, New York State Senator Olga Mendez and Helen Polonsky, chairman of the New Democratic Coalition. A panel on orgaiuzing the un employed was led by Seymour Posner the commissioner of Workers Compensation and chairman of the New York State Assembly Labor Committee. The panelists discussed the pros and cons of whether the Democratic Party was a "viable vehicle for progressive action in New York City." Some 150 delegates and 100 observers met at Houston's Airport Holiday Inn, February 16-19, 1979, for the fourth national convention of the Democratic Socialist Organizing Committee (DSOC). DSOC's advertised convention participants were listed as including Rep. Ron Dellums (D-CA), Joyce Miller-president, Coalition of Labor Union Women, City Councillor Hilda Mason-DC Statehood Party, Maury Maverick Jr., San Antonio, Texas, James Farmer executive director, Coalition American Public Employees, William Holayter-political action director, International Association of Machinists, Jose Angel Gutierrez-La Raza Unida Party, Crystal City, Texas, Ruben Berrios-head of the Puerto Rican Independence Party and Kris Muller-Osten, a representative of the Willy Brandt led West German Social Democratic Party. Michael Harrington's keynote speech stressed the need for DSOC, through its Democratic Agenda coalition, the Progressive Alliance headed by United Auto Workers president Doug Fraser and the Citizen-Labor Energy Coalition of IAM presidènt William Winpisinger to work together to force Congress to pass national health insurance, regulation of bank credit, a public energý corporation, full implementation of the Humphrey-Hawkins Full Employment Act, to drastically cut the defense budget and to force prompt Senate ratification of the SALT-II treaty. Support by the liberal labor establishment was also emphasized. by the fact that among featured convention speakers were William Winpisinger;, lAM president and vice chair of DSOC, Martin Gerber, vice-chair of UAW, Henry Nicholas, president District 1199 and. Marjorie Phyfe, Machinists Non Partisan League and David Liivingston. Further among labor people on the DSOC National Advisory Council were Victor Gotbaum and Jerry Wurf of AFSCME, Dolores Huerta of the United Farm Workers and Cleveland Robinson of UAW District 65. Among the elected officials who "are socialists," Harrington named Rep. Ron Dellums (D-Cal), Hon. Gretchen Kafoury of Oregon, Ruth Messinger, of New York, Maryann Mahaffey of Detroit and Harry Britt of San Francisco. Ramon Jimenez, a South Bronx community leader who was an invited speaker at the public meeting, chided the anti-Reagan' forces and sounded a note of urgency. Tony Benn, a member of the British parliament and leader of the Labor Party, reminded the audience that 25 milion Soviet citizens died in World War 2 and that "we must not forget in Europe or in the United States what we owe. the Russians" for their heroism in that struggle. Benn called for the closing of all nuclear bases in Britain 'and said that his party woould work for a nuclear free .zone in Europe. Unless the arms race is stopped, he said, "we will lose our liberties to our domestic military esabIishment. " Greetings to our friends in the New American Movement from you friends in the Democratic Socialist Organizing Committee. for their work on people's utility districts and plant closures. Greetings to the 10th Anniversary of NAM. Chicago DSOC salutes Milt Cohen and Vicki Starr For unity in the struggle for democracy and socialism. Congratulations to NAM for 10 years of dedicated contributions to the left, the country, and the world. Other branches of DSOC to congratulate NAM were: Baltimore, Bay Area San Francisco, Austin TX and Detroit. This page was last modified on 1 February 2019, at 00:57.